WASHINGTON, April 11, 2019 – Julian Assange, I think we can all agree, is a dirtbag. But that doesn’t necessarily mean it’s a good thing that he’s been arrested and will apparently be extradited to the United States. There’s a clear rule journalists follow: If my source stole important documents and gives them to me, I can write about what they contain. What I can’t do is break down the door to the government building so he can get inside. Which gets to one reason there are plenty of liberals feeling satisfied at seeing Assange led off in handcuffs. 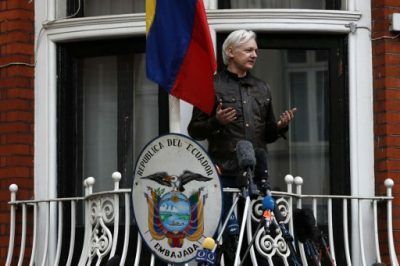 While WikiLeaks’ modus operandi was highly controversial before 2016, it was at least operating according to a defensible set of principles, promoting the idea that people everywhere should know the things governments seek to conceal. But then in 2016, Assange and the group seem to have essentially decided that, for whatever reason (loathing of Hillary Clinton, probably), they would cooperate with the Russian government in a joint effort to help get Trump elected president of the United States. That effort was successful, and it was not exactly a victory for the cause of transparency and press freedom. Up until 2016, conservatives were generally more critical than liberals of WikiLeaks, given the conservatives’ greater suspicion of whistle-blowers and the idea of exposing government secrets. I’m sure many of them felt a twinge of ambivalence when the organization to which they had been so hostile joined the Trump cause and their candidate himself began praising them lavishly on the campaign trail. “I love WikiLeaks!” Trump proclaimed, and mentioned them 164 times in the final month of the campaign. But they got over it; to take just one example, Secretary of State Mike Pompeo, who became intensely critical of WikiLeaks after the election, was a big fan during the campaign.